That long stretch at the end of the day feels great! And, what you might look forward to the most is sitting back, relaxing and finally getting some rest. However, not everyone can say the same thing. While we all want rest and relaxation, some people often wake up feeling even more tired than when they went to bed. And that is never a good thing. What is Dental Sleep Medicine (DSM)? DSM is an area of dentistry focusing on the use of oral appliance therapy to manage sleep-disordered breathing, which includes snoring and obstructive sleep apnea (OSA). Dentists pioneered the use of oral appliance therapy for the treatment of OSA and snoring. The use of an oral appliance allows for a more comfortable treatment option for many patients that might be CPAP inept. It is similar to a mouth guard for sports or an orthodontic retainer, which makes for an easier solution to a condition. A custom-fit oral sleep appliance is an effective treatment for preventing the airway from collapsing by supporting the jaw in a forward position. An easy solution for a complicated condition. And, with the help of a sleep physician, you can receive proper diagnosis in order to properly treat your patient. Periodontology is a dental specialty that involves the prevention, diagnosis and treatment of diseases of the supporting and surrounding tissues of the teeth or their substitutes. It is also the maintenance of the health, function and esthetics of these structures and tissues. In other words, a periodontist is a dentist who specializes in the prevention, diagnosis and treatment of periodontal disease, as well as the placement of dental implants. While periodontology focuses on prevention, diagnosis and treatment, so does dental sleep medicine. However, dental sleep medicine dentists don’t do the diagnosing. Instead, dental sleep medicine dentists work with sleep physicians to gain a diagnosis after they might have noticed symptoms or signs of sleep disordered breathing or a patient’s responses to a questionnaire showed a possibility of this condition. From a diagnosis through a sleep physician, dentists can plan for proper treatment with oral appliance therapy. Similarly, sleep apnea affects the body in the same way. From increased risk of cardiovascular disease to diabetes, comorbidities of sleep apnea are nothing to be ignored. By treating sleep apnea and periodontal disease, you can help your patients prevent further complications and systemic conditions. Take a stand and help your patients receive the best care available. Remember, you’re often the first step toward a healthier life for your patients, so make sure you are aware of signs and symptoms. 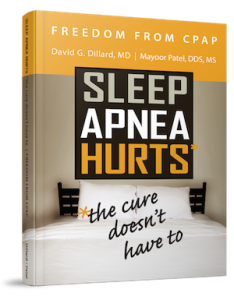 In March of 2015 I teamed up with Dr. Dillard to create Freedom from CPAP: Sleep Apnea Hurts, the Cure Doesn’t Have To. Together we wanted to educate dentists and other physicians on sleep apnea and the options available for treatment. If you haven’t picked up this educational book on sleep apnea, I highly suggest purchasing at least one copy now. And, if you have already purchased the book, now what? 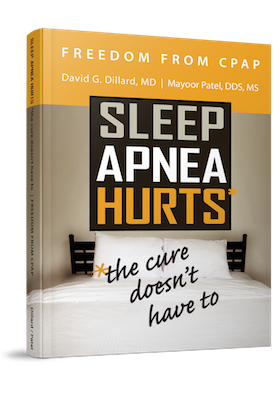 With the availability of this educational book on sleep apnea, I want to help you help your patients receive the care they need through better understanding. Purchase the book for yourself or your entire dental office. By reading this book you can take the next steps toward a better understanding of sleep apnea and the treatment options available. Let’s take a look at a few ways you can use this educational book to help your patients and staff in the area of sleep apnea. Freedom from CPAP: Sleep Apnea Hurts, the Cure Doesn’t Have To can also be a beneficial tool for your office to read themselves while also sharing the information with patients. Supply this book for your team, or have them purchase the book to improve their knowledge and understanding of sleep apnea ($15 is a steal for a book these days!). While it is important for patients to understand this condition, it is even more important for your dental office to know sleep apnea, what it is and how to treat it. Knowledgeable staff members go a long way in helping with diagnosis and treatment of your patients. Take charge of your office and your patients’ health by providing, “Freedom from CPAP: Sleep Apnea Hurts, the Cure Doesn’t Have To.” The more your patients and staff know, the better they are equipped to take the next steps in sleep apnea recognition and treatment. Click here to purchase Freedom from CPAP: Sleep Apnea Hurts, the Cure Doesn’t Have To.